I hope you are enjoying the home tour so far. As we go along I'm adding links to the sidebar with each room so you can revisit them at any time. Just a few more rooms and the tour will be complete. Today we move to the master bedroom. I believe I was hopping through blog land one morning and I ran into your bedroom photo. I knew I immediately I would live pretty much everything that was going on in your home. it looks great! would you mind sharing the wall paint color? im re-doing mine and im trying to decide between the right gray or cream on the walls!! wow! It is just perfect! I am glad I checked in....loving the tour. I LOVE those gray & pattern sheets - where did you get them? What a cute room! I am obsessed! Meg, they are Waverly from Ross. Thanks! Mama Stephie, I actually purchased the headboard at a damaged furniture store and pieced it together with the footboard and rails from Garden Ridge. Love this room! I am looking for a white matelasse coverlet. Where did you get yours from? Your blog has such fabulous ideas! I have been searching for a plain blanket/throw in that exact mustard color for almost a YEAR now without ever finding a single thing! 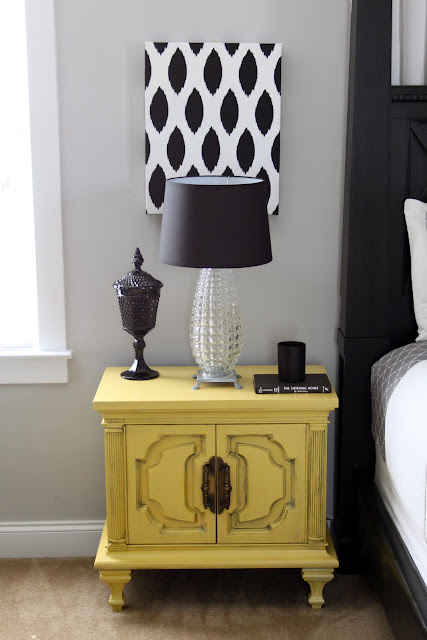 Finding this post is like winning the design-search lottery for me and my bedroom! Where did you EVER find this blanket?? I would be eternally grateful to know! What a perfect shade of gray! This is exactly what I'm hoping to use for our kitchen. Which paint color & brand did you use? Beautiful! I am looking for that exact yellow throw on your bed. Can I ask where you got it from? 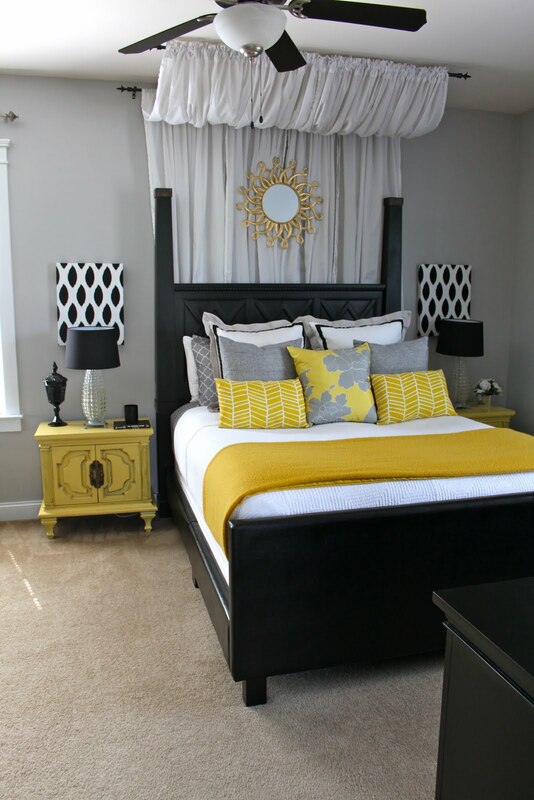 Can you ease share where you found the yellow throw and the fabric on the lumbar pillows? Thanks! Your room is gorgeous! You did a wonderful job!!! Love this room! 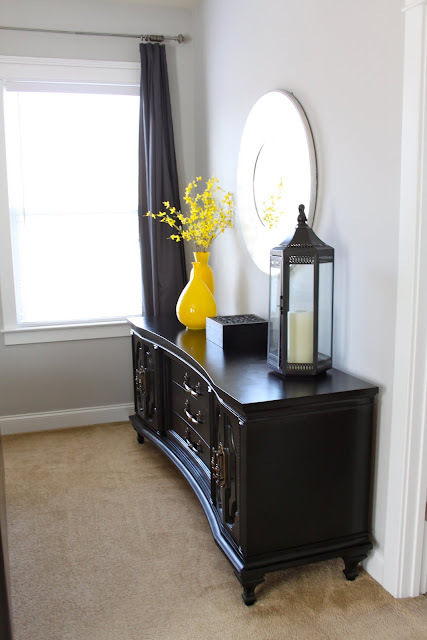 When you painted the furniture, did you sand it first? I am also wondering about the gray paint color. It's exactly the shade I'm wanting! You said your bedding is Waverly by Ross. Is there a website? Or a store? I'm having a hard time finding anything like yours and I absolutely love it! It's gorgeous! 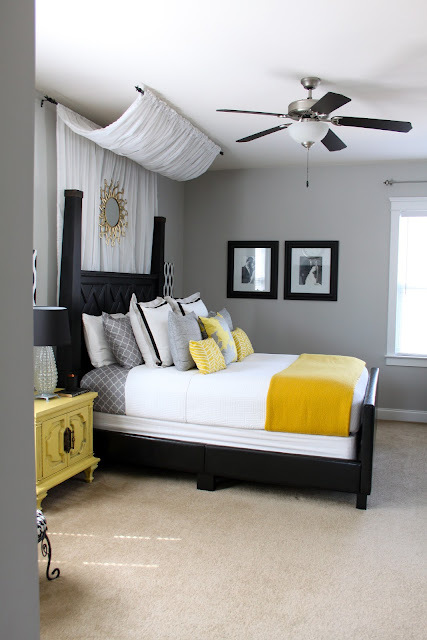 I found your beautiful bedroom picture on Pinterest and I am so inspired to do the curtain canopy in our bedroom! I just have a question..how did you use the four curtains? I see that both rods have the curtains attached. Did you drape 2 curtains on the curtain rod on the roof first and then drape 2 curtains on the curtain rod on the wall next? What color is this grey? I love it! I am with the other ladies asking about the bedding. 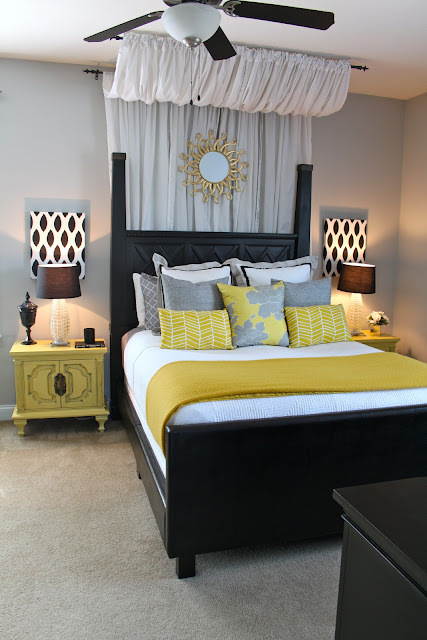 I am searching high and low for the sheet set and for the the yellow blanket! pretty please share or help us find it online!!! I have been able to find the sheets only in full size. is that the size of your bed or were you able to find them in queen as well? I just LOVE that canopy! I'm planning to do this in our Master Bedroom, and praying it will look just as great with our sloped ceiling. Yours is gorgeous! Hi - I LOVE this room and like several others have commented, I've been looking for a yellow throw just like that for months! Where did you find this one?? I am succumbing to the trendy yellow and black bedrooms...and I heart yours! love the 'free furniture update'!!!!!!! it added the PERFECT ammount of color pop! sweet job! Hi I was wondering where you got your grey and white sheets? I can't find any like them anywhere! Hi! To start off I just want to say your work is absolutely fabulous! Also, I am amazed that you found another person that has the same color scheme in their master bedroom as us! Love it! However, I am trying to do the drape behind my bed and I cannot figure out how to secure the drapery rod to the ceiling. How did you do that! HELP! My email is cmorgen12@gmail.com thanks! Does the drapery part pop off easily for washing? How do you keep it from collecting a bowl of dust? I redecorated my daughters bedroom yellow and grey and after two different shades of grey I'm still not happy with the wall color. Please, please tell me what shade and brand you used so that the 3rd time I paint her room will be the last - yours is beautiful!!! Hello! I was wondering how long the drapery panels are that you used for your canopy? Thanks! Hi, can you send me the grey paint color? Love it all!!! 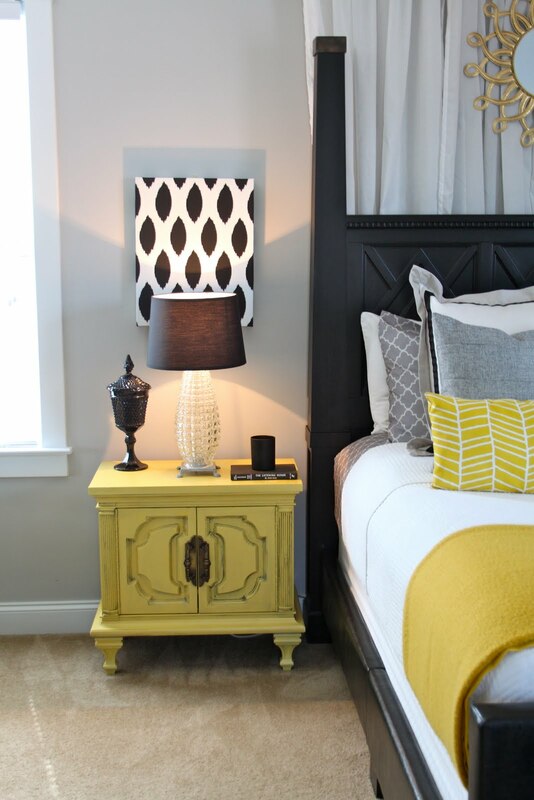 I love how the color of yellow pop in this room! I love your sheets! Where did you get them? I have been searching for some bedroom inspiration for a very long time and then I came upon your lovely blog. I know it has been a while since you posted, but I believe I have found my jumping off point. So peaceful yet so beautiful. I love it. After looking through all your other photos I am now smitten! All the best with your blogging and creative endevours. Hopefully soon I can send you a picture of your inspiration! I would also love to know where you found the bedsheets and pillows! 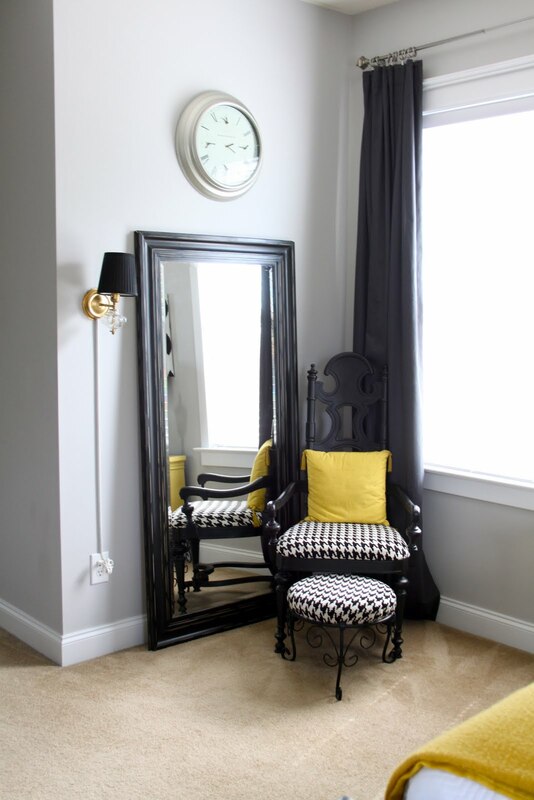 Beautiful room, can you please share the grey paint color's name and brand? I, like everyone else, LOVE your bedroom & have been looking for something like this. WE already have the black bed and want something to go with our white down comforter. Can you please share the paint color/brand? and also where you got your bedding and throw pillows? Perfect grey wall color! Would you mind sharing the color? Me too! What paint Olof is that? This color gray is perfect! What color is it? LOVE this style. 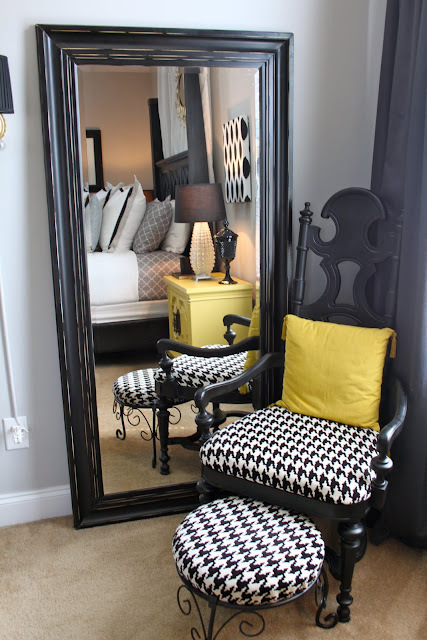 Great inspiration for my master bedroom. What size are those canvases?? Thanks! Thank you! They are approximately 15" x 18"
how much yard use in canopy? can this look be done over a window seat with the bottom part on tiebacks? This is exactly how i want my room!!! what is the name of the pattern on the chair? The pattern is called houndstooth. I bought it at a local fabric outlet store, but you can find something similar online. where is the large mirror from?